Far from improving traffic congestion, Uber and Lyft are encouraging people to ditch public transport. 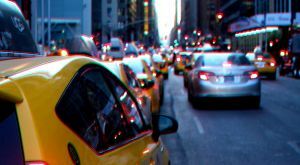 Ride-hailing services like Uber and Lyft were supposed to make our streets less congested, but studies suggest that they’re having the opposite effect. A report published by the UCDavis Institute of Transportation Studies in October 2017, which surveyed over 4,000 adults in seven U.S. cities, found that after rolling out one of the two services public transport usage dropped by six percent. More worryingly, the study found that between 49 and 61 percent of journeys made using the likes of Uber and Lyft would have been made on foot, on a bike, on public transport, or not made at all, if those services weren’t available. This observation was echoed by a new study carried out by the Metropolitan Area Planning Council, which surveyed 944 ride-hailing passengers in the Boston metro area. Here, 12 percent said that if ride-hailing services weren’t available, they would have walked or cycled, and 42 percent said they would have used public transport. This stands in stark contrast to comments made by Uber co-founder Travis Kalanick in 2015, when he said “we envision a world where there’s no more traffic in Boston in five years.” According to a report from the Boston Business Journal, he reiterated his point saying that if every car in the city was an Uber, the road network would be way more efficient. The company’s big plan for the future revolves around a self-driving fleet, which they claim could potentially prevent traffic jams. If once there were hopes that ride-hailing services would work alongside public transport, they seem to have been quashed. “Ride sharing is pulling from and not complementing public transportation,” said Alison Felix, an author of the MAPC report, in an interview with AP News. But this development doesn’t come as a surprise, not for everyone. Over a year ago, in an article for The Guardian, a senior fellow at the New Cities Foundation Greg Lindsay wrote that Uber was looking to “disrupt the bus.” If ride-hailing services are going to continue to play a major role in our travel plans, public transport might pay the price.